Michele Maggini is full professor of Organic Chemistry and, currently, head of the Department of Chemical Sciences - DiSC - of the University of Padova where he completed his Laurea degree in Chemistry in 1984with G. Scorrano. In 1986 with P. Eaton at the U. of Chicago he isolated the cycloaddition product of 1,2- dehydrocubane (cubene) one of the most pyramidalized olefin yet known. After one year in the industry, in 1989 he joined CNR working with M. Prato on the total synthesis of natural products and on the organic functionalization of fullerenes. He explored many new functionalization protocols and also started applications of the functionalized fullerenes in materials science and medicinal chemistry. 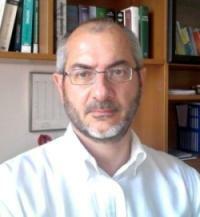 In 1998, he joined DiSC as associate professor and, since then, his research interests have focused mainly on the synthesis of molecular organic materials for solar energy conversion and on the development of flow chemistry platforms and methods for the synthesis of functionalized nanosystems, the study of reaction kinetics and of batch-to-flow transpositions of distressing or unsafe chemical syntheses. In collaboration with leading groups in Italy and Europe, he contributed to develop pathways to control the microstructure of donor-acceptor blends and improve the efficiency of organic solar cells. His scientific production counts 159 ISI publications and 3 patents. Michele Maggini research interests focus mainly on the synthesis of molecular organic materials for solar energy conversion and on the development of flow chemistry platforms and methods for the synthesis of functionalized nanosystems, the study of reaction kinetics and of batch-to-flow transpositions of distressing or unsafe chemical syntheses. Preparazione e funzionalizzazione organica del grafene mediante reazioni in flusso continuo. L’obiettivo del progetto è quello di preparare campioni di grafene per esfoliazione noncovalente della grafite, per poi procedere alla funzionalizzazione organica del materiale grafenico ottenuto mediante l’impiego di reattori in flusso continuo. Preparazione di microcapsule polimeriche in condizioni di flusso continuo. Il progetto ha come obiettivo la progettazione e la realizzazione di reattori a flusso per produrre microemulsioni di specie monomeriche che saranno poi convertite in microcapsule attraverso processi di polimerizzazione termica o fotochimica per applicazioni nell'ambito della conversione dell'energia solare. Sintesi di idrogel biodegradabili per applicazioni nel campo dell'agricoltura conservativa.